Is 28 Days Later a title or a threat? A follow-up to 28 Days, Sandra Bullock's "feel-good" film about alcohol addiction? Pass the booze, indeed. Thankfully, though, 28 Days Later has nothing to do with zombies (the rum "n' brandy variety) and everything to do with zombies (the flesh-eating kind). It's been a while since we've had a halfway decent genre flick of this nature, and while this latest effort from director Danny Boyle (Trainspotting) doesn't add much to the canon of the undead (despite the ad's preposterous claim that "Danny Boyle reinvents the zombie horror film"), it's worthy enough for creature feature aficionados who've been having to make do with the dismal likes of Darkness Falls. Each zombie flick creates its own version of what turns ordinary citizens into the walking dead; here, research scientists in England have been experimenting on chimpanzees, infecting them with a virus that somehow captures each creature's inner rage. In the opening scene, militant animal activists release the infected chimps, who then proceed to bite their would-be rescuers. Cut to 28 days later, when a cycle courier named Jim (Cillian Murphy) awakens from a lengthy coma and wonders why all the city streets are deserted. Well, almost deserted: He's soon chased by crazed humans with blazing red eyes and rescued by warrior woman Selena (Naomie Harris) and wisecracking sidekick Mark (Noah Huntley). The pair quickly explains to Jim about the "inner rage" virus and how, instead of turning people into a hulking green giant, as in the adjoining auditorium's main attraction, it transforms them into mindless ghouls with a nasty desire to nibble on the uninfected. At this point, we're still in the first third of the film. In fact, the picture can be equally split into three acts, and, as the saying goes, two out of three ain't bad. The first part captures that fever-dream sensation of being one of the only people left alive, a mere blip on a suddenly empty landscape in which a once-populated metropolis now feels like an absurdly oversized mausoleum. Practically every end-of-the-world feature, from 1959's solemn On the Beach to 1984's giddy Night of the Comet to the TV adaptation of The Stand, has managed to capture that unsettling yet oddly liberating feeling that surely clouds the minds of the survivors. The second chunk of the film ratchets up the suspense, as the survivors (which now include a father and daughter played by Brendan Gleeson and Megan Burns) head out on the road hoping to hook up with other survivors and battling zombies along the way. It's only when the movie reaches its third act that it runs into trouble, as our heroes make contact with a small outfit of soldiers who protect them from the undead but who also have their own insidious agenda brewing. 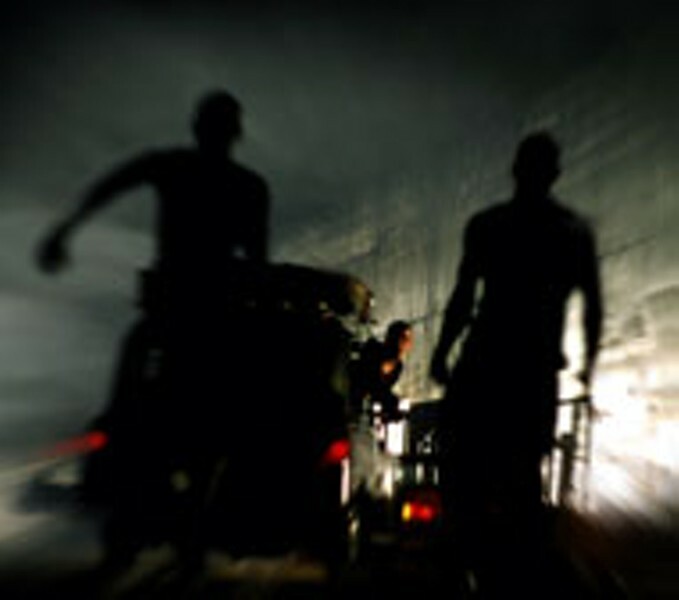 This notion that some of the humans might be as wretched as the zombies is hardly revelatory, having already been handled to perfection in George Romero's 1978 Dawn of the Dead, in which the human leads were forced to contend with both the flesh-munchers and the sadistic members of a motorcycle gang. Because of the way the movie is shot (cinematographer Anthony Dod Mantle uses grainy digital video throughout), it may seem excessively bloody, but in retrospect it's apparent that Boyle implies much of the gore rather than actually showing it. And moviegoers who want to inject some contemporary subtext into the proceedings can certainly do so without hesitation -- it's easy to watch this film and contemplate the ramifications of the unchecked spread of SARS, Anthrax and, given its setting, even mad cow disease. Like the sharpest horror flicks, 28 Days Later makes the line between fantasy and fact look frighteningly slender.